This is an extra, extra TGIF because it is a long weekend and my troop is off on VACATION all next week. I seriously can hear the angels singing. HALLELUJAH!! I thought I would link up today to share some Friday favorites of what we've been enjoying around here this week. We have been LOVING this recipe for Meatloaf Balls. It's honestly hard not to make them every week. Justin is hooked, and usually I can even get Teddy to eat them too. If you're like me and don't feel like taking the time to make mashed potatoes, I'm a big fan of the Oprah (O That's Good) Potatoes that have some mashed cauliflower mixed in! We are gearing up for our first bit ROAD TRIP with Teddy next week. We will be driving down to Gatlinburg, TN to stay in a cabin for a few nights and then head to outside Atlanta for a family wedding. I have been obsessing over this country playlist on Spotify that I think will be getting a lot of rotation on our trip (along with Baby Shark, of course!). And while we are on the subject, Sam Hunt is playing at Wrigley Field this weekend with Luke Bryan. If ever there was a concert that I am supposed to be at, this would be it. Since I'm already heading to Ravinia tonight with my mom and the first Notre Dame game is on Saturday night (someone has to make the dip & chili!! ), it's just not going to happen. Between that, and missing the PopCast Live in Chicago next weekend with BooMama and BigMama in town, I don't even know who I am right now. Speaking of FOOTBALL!! You guys...I cannot even tell you how pumped I am for fall. It has been hellaciously hot here lately, and this preggo lady is SO over it! Fall is always my favorite season, but it is extra welcome to show up this year. I was literally giddy yesterday morning when I woke up and it was 59 degrees. We had our 20 week ultrasound this week for Baby Girl Miller who is due in January! I am so thankful to say that everything went great and this is finally seeming real that we are actually having another baby and a GIRL! Little miss is very active and was flipping around all over the place. 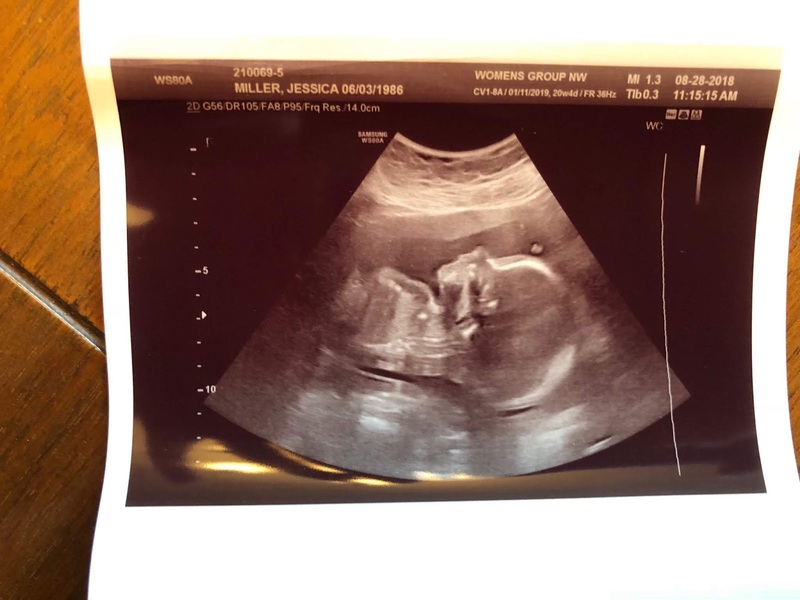 I am absolutely loving feeling all her little kicks. It's going to be so different this time around having a winter baby. Teddy was born at the end of June, so I can't help but feel like January will be the polar opposite...literally. I just cannot handle the cuteness. Alrighty, that's all I have for today. Have a fantastic LONG weekend, and hopefully I can share some vacation pictures once I'm back. I put the call out on Instagram stories (you can request to follow me @jesrmiller) to see if people wanted a weekend recap today or a Mom Hacks Monday post. I get the feeling that places like Petsmart are a severely underused destination for moms of toddlers. We started taking Teddy when he was about 14 months old because he was obsessed with fish. When he first walked in the store, you would swear we were at the Shedd Aquarium. He was screaming gleefully, running around pointing to every single fish in every single fish tank. Now, we also oogle over the reptiles, birds, cats, and of course the dogs that are in daycare. This is such an easy and CHEAP activity for a rainy day. Just make sure to bring a sucker so that you can lure your kiddo out of there at the end without buying a lizard. The best part is our Petsmart is across the street from a Chick-fil-a, so we basically have an afternoon made with that combo. 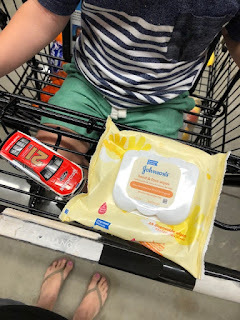 My friend Ashley introduced me to these wipes!! They are the absolute best for running around with your kids, and you can find them almost anywhere. I'll often buy the generic version if available to save some money (Target has one). They can obviously be used to clean up messes on your toddler's hands/face (and who am I kidding...my hands and face! ), but I also like to think they double as a sanitizing wipe for things like the grocery cart handle, etc. They claim to wipe away 95% of germs and they still seem very gentle on skin. I keep a pack of them in my purse at all times. Becoming a mom for the first time (or second...or third...) can be overwhelming in so many ways. I dealt with a lot of anxiety postpartum and I think one of the things that really helped me was finally coming to the realization that "everything is a season." When you have a newborn, the season is: feed, change diapers, worry, no sleep, cry a little (or a lot), house is a disaster, on repeat. When you have a toddler, it's constant correcting, fighting to get them to eat, trying not to raise a monster, and maybe a little more sleep and cleaning than before. It's easy to want to rush through those time period to when you think it will be "easier" or to even feel envious of those who are in a different season of their life. Just remember - this is not going to be your exact situation one year from now, five years from now, ten years from now. I'm not saying that I'm encouraging wishing away any season. It's more about keeping things in perspective and compartmentalizing, because nothing is forever. Be in the moment and do the best you can. Bloom where you are planted. Someday, your kid will sleep longer than 2 to 3 hour stretches. Someday, maybe your kid will actually eat a salad. Some day, maybe you will be able to have a kid-free date night. Right now, love on your kiddos (and your life in general!) where they are and do the best you can. Sometime in the middle of last year I was forced into a period of some major self reflection. One of the things that came out of that period was learning that I am not so good with change. Maybe that's why I decorated our first baby's room (a boy) with a Peter Pan theme. Deep down, I must have known that once he was here, I would never want him to grow up. Maybe this is also why I am really struggling when moms post on Facebook questions about things like "infant potty training." What the actual heck is that?! Am I the only mom that has zero desire to get my toddler potty trained before the new baby comes?! Is this just my fear of change and not wanting him to grow up? Peter Pan syndrome? I was having an emotional day last week after hearing some heartbreaking news about an old friend of mine whose son suddenly was diagnosed with a life threatening disease. 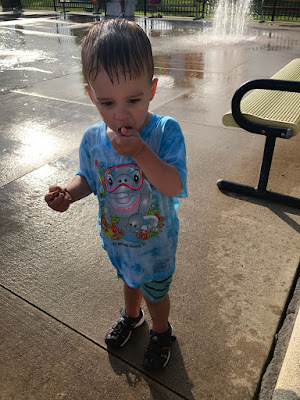 I decided I wanted to plan a special afternoon for Teddy after daycare, and landed on going to the splash pad. I always find it sweet when Teddy will find random, discarded toys places and get super excited over someone else's throw away item. For him, its like finding lost treasure. So, when he came running up to me with something tiny and green in his hand yelling "DI-SORE!!!!" (aka, dinosaur), I said "awww, yeah!! did you find someone's dinosaur?" Only, this seemed to be only a teeny tiny piece of someone's discarded DI-SORE. And I kid you not, I was staring at this little green treasure for a good 20 seconds before I realized it was not actually a DI-SORE, but a piece of someone's chewed up wintergreen gum. Peter Pan. DI-SOREs. Nasty old gum destined for a shoe that a toddler has begged to take off. Not all green things are alike, but they do make for fantastic memories and moments I clearly do not want to change or forget. (Don't call DCFS, he is not chewing the gum! It's the pretzels I bribed him to wear his shoes).